After being diagnosed with breast cancer, many patients’ first thoughts are, understandably, about their survival outcomes. But after being given a treatment plan and the assurance that they will live, another question creeps into their minds: Will my chemotherapy treatment cause me to lose my hair? That was one of the thoughts that Nancy Marshall had when she was diagnosed in 2006. Luckily, her breast cancer was early-stage, so she only needed surgery, not chemotherapy. But when her good friend Shirley Billigmeier was diagnosed three years later in 2009, she was given a treatment plan that included a lumpectomy, radiation and chemotherapy. And then once again, hair loss became a major concern. But through a friend, Billigmeier heard about cooling caps, which cool and constrict hair follicles, reducing the amount of chemotherapy that gets to the hair, therefore limiting hair loss. Billigmeier’s oncologist told her that he hasn’t heard much about the cooling caps, and was a bit apprehensive that they wouldn’t work, but said that she was free to try them if she wished. So the women had an industrial freezer set up in the infusion room. 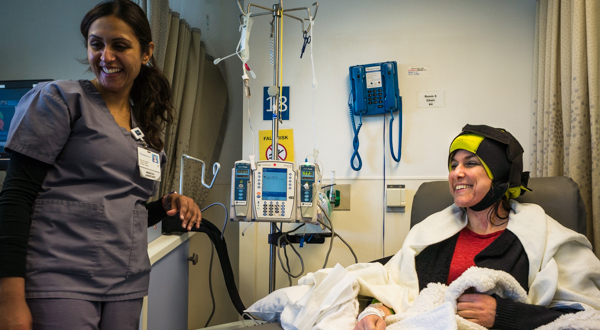 “On the day of her third chemo, when she shouldn’t have had a strand on her head, we walked through the infusion center and staff members were lined up to see Shirley. When she walked in with a full head of hair, there were tears in the nurses’ eyes,” Marshall said in an interview with CURE. She did. And so the two women established the Rapunzel Project. The Rapunzel Project’s main mission is to spread awareness about the cooling caps – two of which, the Paxman Scalp Cooling System and the DigniCap, have received Food and Drug Administration (FDA) clearance since the inception of the Rapunzel Project. Billigmeier and Marshall know how important hair preservation can be to patients facing cancer. The Rapunzel Project teams up with salons and hair care companies to spread the word. They also provide detailed information to patients, the medical community and media outlets. “Maintaining your identity and sense of self is so hugely valuable that we just felt we needed to let people know that this was out there,” Marshall said. And while the Rapunzel Project does not currently offer financial assistance for patients to be treated with cooling caps, Billigmeier and Marshall are strong advocates for lowering their price and getting insurance coverage. The use of cooling caps is growing, Marshall said. And though the system may not yet be perfect, we are heading in the right direction.